● World Wide Stereo’s website features Daily Deals and Weekly Deals. These deals can save you over 50% on products such as headphones with mics, televisions, and speakers. ● Ongoing Standard Free Shipping is offered on all orders within the continental US. ● Occasionally, you can save up to 70% on clearance items on the ongoing Clearance Page. 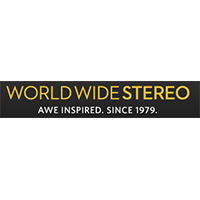 ● Coupon codes for World Wide Stereo are occasionally available and can save you anywhere between 5-75%. These tend to be most commonly available. The sales you’ll find won’t necessarily be seasonal, but sales are available for common occasions, such as Black Friday. ● Sweepstakes/Giveaways are occasionally featured on World Wide Stereo’s website. These are quick to enter, with no purchase necessary; you simply fill in details such as your address, name, and e-mail on a short form. Prizes such as Parrot Zik Wireless Headphones by Starck are available, although the value of prizes varies by Sweepstakes. Some typical requirements for World Wide Stereo’s Sweepstakes are that you are at least 18 years of age, and live in the continental US. At World Wide Stereo, you can shop for products, check out deals, and learn more about design and installation, as they relate to your particular goal. You can shop according to a large inventory of brands, or you can focus on specific stereo products. Some of the categories related to home audio products, headphones, portables and Bluetooth products, TVs and video products, products for cars and mobile devices, and even a range of stereo-related furniture products. Information on retail showrooms is also available through this website. In addition to all of these things, a wide variety of accessories are also available for most of the categories that are featured at World Wide Stereo. For most up to date offers check out WorldWide Stereo on Facebook and Twitter or contact WorldWide Stereo Support for any questions.